Good afternoon and happy Thursday. 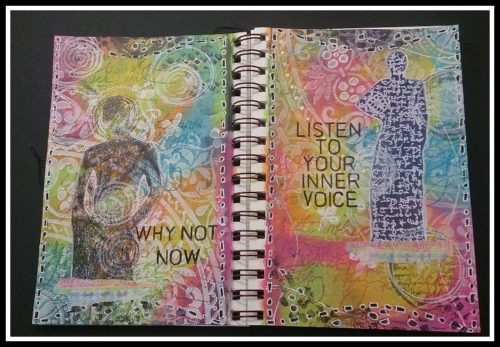 This is a journal page that I've made with a facebook group that I belong to. This journaling lark is all very new to me, but I did enjoy creating it, and that's what matters. There's lots of painting and stencilling, and bits of everything really, and it was fun! I've used DecoArt Americana Premium Acrylics and some Dina Wakley and Dylusions stamps and stencils, all of which are available from Country View Crafts. Your page is perfect, Sue! Beautiful bright colors! And I love the sentiment! Kisses, my friend. A fantastic spread is this! Gorgeous! I can see the fun that you had with this journal page. I love that you enjoying it so much! These are great messages to put down in your journal. Oh my, so many colors! I love the pattern of your background and all the colors mixed together. Thank you for joining us over Simon Says Stamp Monday Challenge.